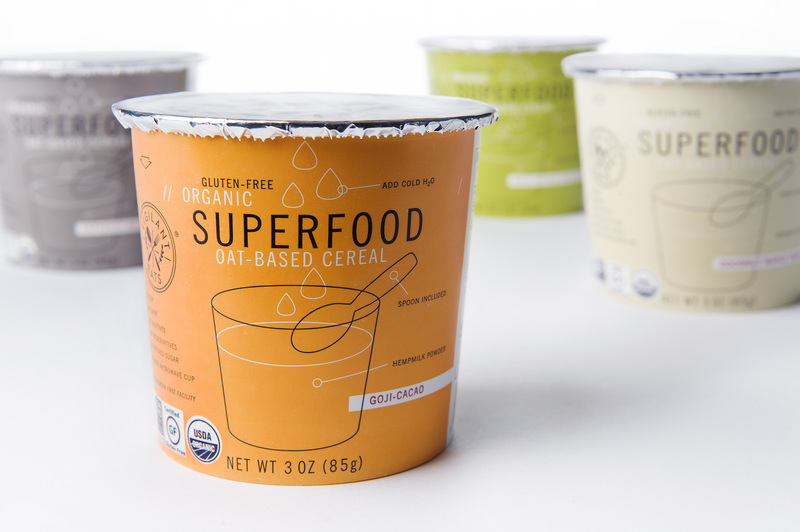 ← New Bestowed Box delivers monthly assortment of best health food! For starters, goji berries are chockfull of antioxidants, and they’re also a good source of protein, vitamin A and vitamin C. Cacao on the other hand is another great source of antioxidants as well as magnesium, which is important for muscle and nerve function. While I am not touting either as a cure for cancer, I do think both of these foods make a tasty and convenient addition to any diet. 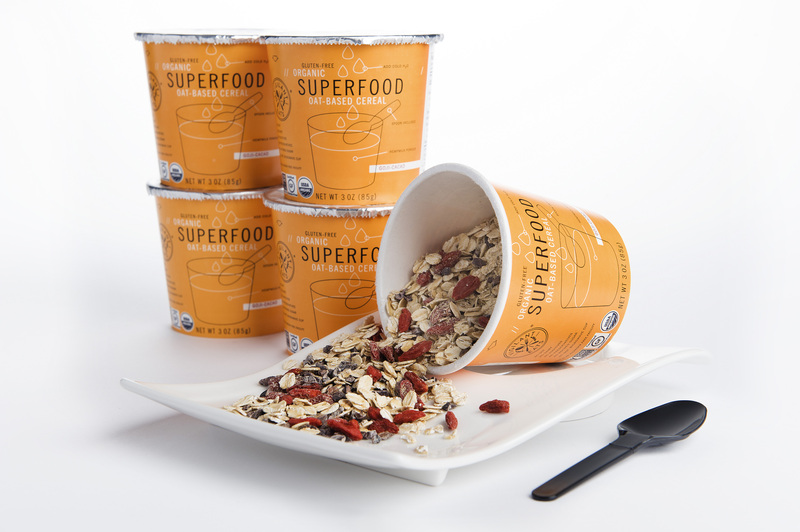 This week I was lucky enough to review and sample Vigilant Eats super food cereal- which uses goji berries and cacao in their “cereals.” Super cool label, gluten-free, organic, non-gmo, and vegan, this disposable cup packed with nutrition is an easy on-the go option for those summer rendezvous. Orrrrr for your other summer activities 🙂 Essentially, Vigilant Eats provides its consumers with a modern, convenient solution for the active or busy lifestyle. Several of the ingredients are raw and all of the flavors are made with certified gluten free oats. All of the flavors are vegan and all you have to do is add some water or milk! I’ve listed ingredients for the first two so that you get a general idea of what is in these superfood cereals. My favorite personally though was the Coconut Maple Vanilla. MMMMMM. yum. It was delicious and indulgent! But it did contain 21 grams of sugar- YIKES! I applaud the company though for using natural sweeteners such as fruit and coconut. The goji one only contains 6g of sugar per serving, which is a little more reasonable in my opinion. Nonetheless these are a healthy, quick option to have as a snack or for breakfast. My favorite thing about this product is the company behind it. Their tag line is Delicious Justice, which means great taste and a product that is produced in a socially and environmentally conscious way. Furthermore, Vigilant Eats supports organizations like the Farm-to Consumer Defense Fund, a national organization that protects and defends the legal rights of consumers to buy directly from farms. 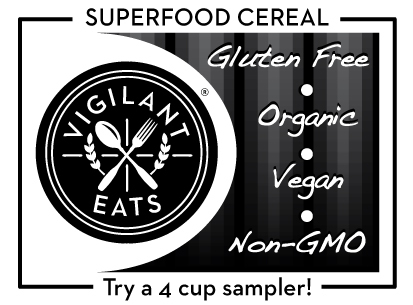 I hope to see Vigilant Eats cereals in more locations in and around Boston very soon! But in the mean time you can purchase it online at http://www.viglant-eats.com/shop-online/. Use the discount code sknutrition to get 10% off plus free shipping on any item on the web store except for the 4-cup sampler pack. I loveee Vigilant Eats super food cereal! Thanks for the coupon code!